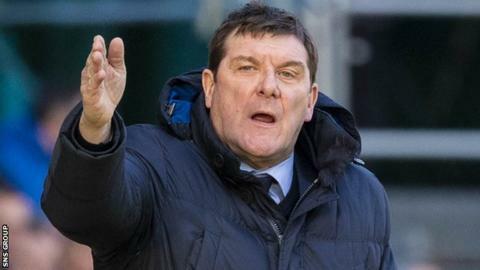 It is "totally wrong" to suggest Scotland's clubs are responsible for the problems of the national side, says St Johnstone manager Tommy Wright. Scotland started Euro 2020 qualifying with defeat in Kazakhstan before an unconvincing win in San Marino. Four Premiership players started in the 2-0 victory over the lowest ranked side in the world, and six in Kazakhstan. "Every time Scotland lose, there is a massive outcry and people saying who they think is to blame," said Wright. "To put the blame on the league clubs, particularly the smaller clubs, to me is totally wrong. The one common thing everyone has been saying about the league this season is that it has improved. "Because Scotland lose a game then it is all the fault of the rest of us? I think Scotland have got to look at themselves, the players have got to look at themselves, there is quality throughout the team." Wright has been frustrated at the lack of international recognition for his standout goalkeeper Zander Clark, while defender Jason Kerr is another who has been mentioned as a candidate. "Obviously in Zander's case, and Jason's, they are deemed not good enough for Scotland at the minute," said Wright, whose side face St Mirren on Wednesday. "There is not a lot more I can do. We are producing players that are doing well for us and that is my job." The Scottish FA are coming in for increasing flak following the poor form of the national side and Wright questions some of the methods being implemented from the top down. The Northern Irishman said: "How we are developing players and the initiatives that have been put in place - are they working? Are they going to work? "I know there are a few people at clubs that are disgruntled with the way they are being asked, or being told, by the SFA to develop players. "But I look at it, and you have to ask why aren't we producing more players for international football? We have got better facilities, there are more qualified coaches, so maybe it is the system that is wrong."